You may wish to try the related problem Building Gnomons first. $G_1$ has area $3$, $G_2$ has area $5$, $G_3$ has area $8$ and so on. Draw the next three gnomons in the sequence. 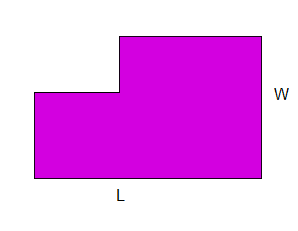 Look at the length and width of the large rectangle from which each gnomon is made. Is there a pattern to the lengths and widths? Now look at the length and width of the rectangle cut out of each gnomon. Can you see any patterns here? Can you generalise and justify what you see? I want to group the gnomons with area 3, 8 and 21 together, and the gnomons with area 5, 13 and 34 together. Can you explain why I want to divide these into two separate groups? Can you give a convincing argument why all the gnomons fit into one of these two groups? What other interesting patterns and relationships can you find? Making and proving conjectures. Fibonacci sequence. Golden ratio. Mathematical reasoning & proof. Representing. Surds. Generalising. Creating and manipulating expressions and formulae. Mathematical induction. Mathematical modelling.